Anne was born into the Marbury family, in England, in 1591. Her father was a minister/teacher who was as a strong advocate of educated ministers (as opposed to the guys who were getting appointed to parishes on the basis of their connections to the local powers). He educated his own daughters; the first 6 of his kids were girls; you can see that if he wanted to educate his own children he couldn’t wait around for sons! This was during the successful reign of Queen Elizabeth who ruled 1558-1603. QE1 opened a lot of surprised peoples’ eyes to what a woman with an education and a chance could do. Anne’s father got into hot water with local religious and political authorities and was imprisoned for two years. He wrote a transcript of his trial. As his kids grew up he would read this transcript to them; together they would poke fun at the ignorant judges who had tried and sentenced him. As you can imagine, Anne did not learn to be a silent or submissive girl. With her mother and father celebrating original thinking while being willing to pay a big price for that freedom – Anne was never going to be a spiritual wall flower. Anne's father died when she was 19. The following year Anne married a guy she had grown up with, William Hutchinson, and they moved to Boston, England. There they heard about an inspiring Puritan preacher – John Cotton. They went to hear him preach as often as they could travel the 20 mile journey, sometimes riding horseback across the countryside. I looked it up, horses travel about 4-5 miles per hour. Would you drive five hours to and from church to hear an especially fine preacher? Puritans believed that being a Christian was a life-long spiritual path of working to be unswervingly holy and pious, as well as being willing to listen to and obey the admonishment of fellow Christian Puritans. Their theology was that only God saves, but the reality was that living strictly was how one proved to oneself and others that God had done God’s saving work in their life. Cotton was slightly “off message” from this. He emphasized that if God extends grace to a soul, then that grace trumps all sin. You can’t sin so badly you can get rid of God’s grace and salvation. The moment and life of salvation will be inspiring and filled with light. It was a matter of emphasis. But that emphasis was hotly debated for decades and in many ways, still is. Consider how many current Christian denominations and congregations are fighting tooth and nail over who can and cannot preach or be in their congregation. Every church is an amalgam of faith, the pursuit of purity, and power. Ask any LGBTQ person of faith if they know what we mean. So Anne and William became successful farmers and business people in their little part of England. Anne also served as a midwife. They went as often as possible to John Cotton’s church, and when they couldn’t make it that far, they went to John Wheelwright’s (their brother-in-law’s) more local church. John Cotton was harassed out of England for his Puritan anti-clerical pomp and pageantry views. In 1633 he hurriedly left England to sail to Massachusetts Bay Colony. The Hutchinsons followed about a year later, right after Anne had given birth to their 14th child! Cotton was hired as one of ministers in the Boston Church, the biggest and richest church in the young colony. Anne started leading in-her-home discussion groups for women where those women could talk about the Bible and the latest sermons they had heard. (She had done this in England, also.) She also shared spiritual lessons and conversation while she was attending women giving birth. She was a good thinker and clear speaker; women flocked to her mid-week studies. Soon men were attending these “women’s groups”, also. Apparently in some of the weeks up to 60 people were crowding into the Hutchinson home to hear her teach and speak. The senior pastor of Boston Church, John Wilson, returned from England where he had been attending to his personal property and business. Once he was back in the pulpit, many people realized he was not nearly as inspirational as John Cotton. People came to Anne’s house midweek; at those meetings some people said unflattering things about their old, boring, angry preacher. You can see the dynamic that is getting set up here. Please feel free to read longer articles in Wikipedia or any number of colonial history articles that exist, that can take you through the debacle that will erupt in the following year. There will be questioning committees. John Cotton will say he’s sorrow for disrupting everyone and back down. 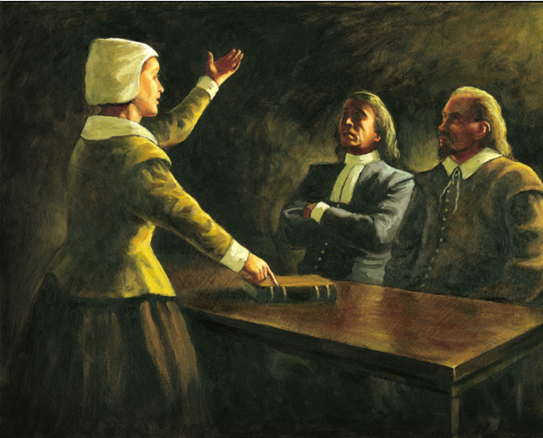 Anne Hutchinson will, eventually, agree to about the same. John Cotton gets his own church in the suburbs and becomes one of the most famous Puritan theologians of all. Anne goes through the same questioning, only they cross examine her much longer. Things she said in a private communication earlier in the process (she had asked if the conversation she was having with church officials was private or official and the men said private) are brought against her as evidence that she is a false leader. Anne is BANISHED from Boston. Two months later she is EXCOMMUNICATED from the church. She and William move to Rhode Island. William dies. Anne and some of her adult and minor children move to what is now the Bronx. Indians in the area who had been scammed and cheated retaliate with mayhem and murder. Anne and all her family are killed except for her red-haired daughter Susannah, whom the Siwanoy warriors kidnap. She will be ransomed by English relatives much later. All of this is just so much history over the dam. A smart woman got to be a leader until the powers-that-be turned on her. It is easy enough to translate her situation into any model we want to consider. Was she an early Quaker? Some of her children would become Quaker leaders in the colonies. Is she a feminist heroine? She had been friends with Native Americans in her Boston neighborhood; she did not distrust the Siwanoy. The reason we know who she is is because she was brought to religious/ governmental trials where her answers were written down. I am most respectful of this simple truth. Religion was more to her than theology. To her, spirituality came from and was connected to the faith of her parents and early family. She could not back away from what she understood to be the lively, light-filled truth of God’s grace in her life. She was a friend to women and a helper to women giving birth. She led a busy, centered, loving, faithful life using her strength, intelligence, and education the best she could in a complicated and dangerous world.